MS Merge or personalized SMS allows you to insert personalized information in each SMS in a bulk list. 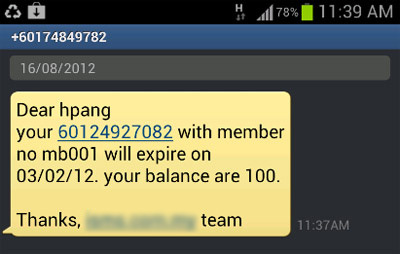 We will show you how to do SMS merge with iSMS account. 1. Create CSV file, follow the format below. 2. The string1 will be membership number and string2 will be expiry date. Save the file as CSV. 3. After that login to isms.com.my, select compose SMS, and then use the tab "CSV compose"
4. Upload your CSV file, and write your message. The %XXXX% will be replace accordingly. 5. Finally, your user will see the message like below. 6. Please feel free to drop us any questions. The SMS merge can be use in multiple occasions. It will benefit your organization by providing best interactivity between you and your clients.